The goal of this project was to create a refillable shampoo bottle. Refillable packaging is a more environmentally conscious way of distributing a product. By making a bottle out of slightly higher quality materials, and giving it a pleasing, more robust look, the bottle is more likely to be retained. Adding simple features to the bottle to improve the user experience will also help ensure the bottle is used for a longer period of time than a disposable bottle. Shampoo bottles are similarly shaped regardless of brand. To gain a better perspective on the types of bottles currently on the market, I visited a number of point of purchase stores. From this research, I realized that the shapes of most bottles are very similar. They were largely tall and slender bottles. There was thus an opportunity to create a bottle with a distinctive shape to set my brand apart from others, making it more noticeable and interesting. After exploring different forms, I created a shape that is comfortable to hold, facilitates dispensing shampoo (as the cap is at the bottom of the bottle), and is refillable. Most bottles with caps at the bottom allow shampoo to flow out as soon as the cap is opened, creating a mess and dispensing too much shampoo. This rubber sphincter would prevent this, allowing shampoo to be dispensed on demand. Branding was also an important aspect of this project. 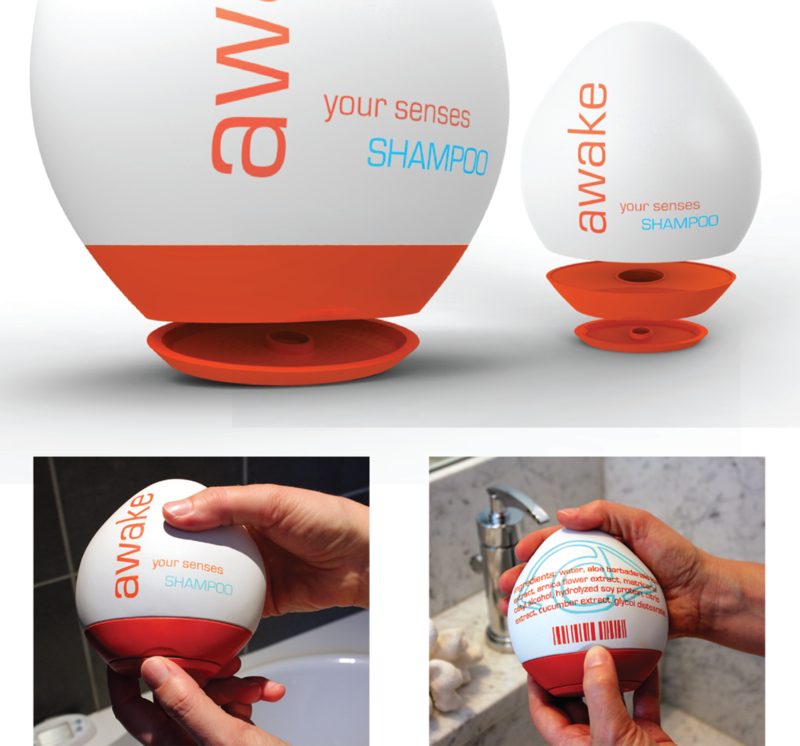 I named the brand 'awake', as the shampoo would typically be used in the morning, and would act to revitalize the user. The logo reflects this as well, by incorporating the shape of an eye into the brand name. Branding was kept very simple to distinguish awake from other products on the market. In order to facilitate refilling, a small indentation was made on the back of the bottle, indicating that the lower half of the bottle can be pulled off at this point. A similar indentation is at the front of the bottle, which facilitates opening the cap.